Thomas Whitty, who made our town’s name synonymous with carpets, was born at Axminster in 1713. His family had lived locally since at least the 16th century. After serving an apprenticeship with Samuel Ramson, a local clothier, he set up his own cloth-weaving business. Shortly afterwards he married Sarah Ramson, the daughter of his former master, and they had twelve children, but sadly four of them died in infancy. By the early 1750s Thomas’ business was struggling, along with those of most other Devon weavers. In order to support his young family, Thomas looked around for alternative ways to earn his living. In 1754, on a visit to London, he saw some carpets in the warehouse of William Freke which had been imported from Turkey. He marvelled not only at their vibrant colours but also their size, and the fact that they were seamless, and as he returned home he puzzled as to how they had been made. After much thought Thomas made some experiments on one of his own looms, and in the Spring of 1755, while his workshop was closed for the Easter fair, he succeeded in making an 8-inch square of ‘Turkey’ carpet. Although excited by this success, he realised that he would not be able to make carpets economically in this way. Returning to London, he managed to gain entry to a French-run carpet factory in Fulham which was making comparable carpets, but struggling financially. It was there that he saw them using vertical looms rather than the traditional horizontal English cloth-making loom, and on returning to Axminster he adapted one of his looms, and by mid-summer 1755 he succeeded in making a prototype of a commercially viable carpet. Throughout his life Thomas employed mainly girls of between 10 and 17 years. His competitors employed mainly men, so not only was he able to keep his labour costs down, but the girls’ fingers were much more nimble than those of the men, giving him a further edge in productivity. However, the critical factor in his success was probably the fact that his start in manufacturing coincided almost exactly with the launch of a competition for carpet making organised by the Society for the Encouragement of Arts, Manufactures and Commerce (the forerunner of the Royal Society for the Arts). The first two years he shared first prize with other manufacturers whose carpets were significantly more expensive than his, but on the third occasion he won the prize outright. 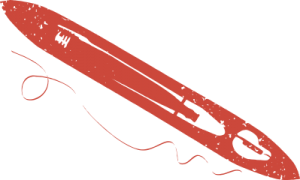 By his own account (see the link above) this, together with word-of-mouth recommendations from satisfied customers, provided the publicity that he needed to keep orders flowing in as fast as he could make the carpets. The reason why word of mouth was so important was that in the second half of the 18th century, and for the first time, carpets became fashionable as floor coverings in English stately homes and country houses, and owners of these houses all tended to know one another. In order to fit the houses’ schemes of decorations, architects often designed key carpets themselves, and Thomas Whitty was often their chosen manufacturer. Thomas Leverton, James Wyatt, Robert Jones and the Adam brothers were among these designers. 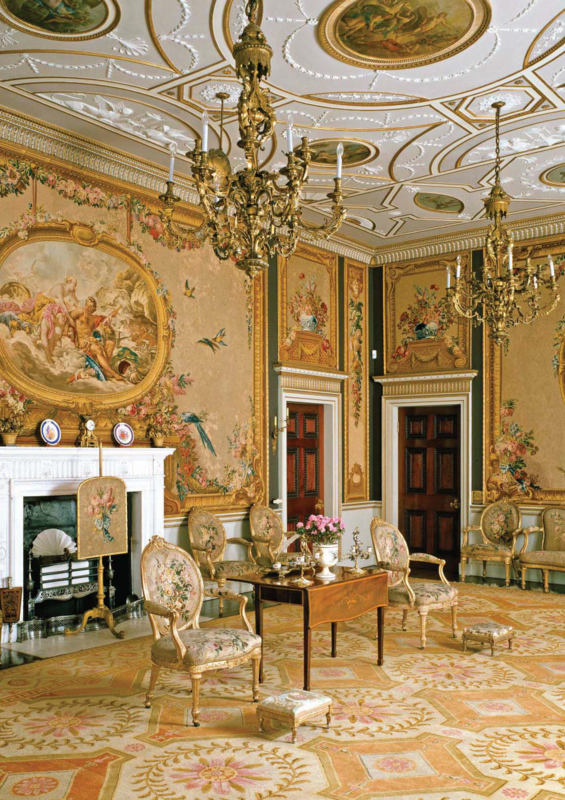 Many of the carpets which they called for can still be found in the rooms for which they were made, such as at Blickling Hall (Norfolk), Chatsworth House (Derbyshire), Dumfries House (Ayrshire), Harewood House (Yorkshire), Kingston Lacy (Dorset) and Saltram House (Devon). There is further information on several of these carpets accessible at Axminster Heritage Centre. Whenever a special carpet was finished it was laid out first over the pews of the church that Thomas attended (the Independent Chapel in Chard Street) before being paraded through the streets of Axminster to the sound of the Minster bells. Such was Thomas’ fame that in 1789 King George III, Queen Charlotte and three of their daughters visited Axminster to see the carpet factory. They were holidaying in Weymouth and were due to inspect the fleet in Plymouth when the King sent word that he wished to visit the factory en route. Amid much excitement the streets were cleaned and decorated in readiness. The Royal party alighted from their carriages at the George Inn and made their way to the factory along streets lined with cheering crowds. At the factory entrance they were met and escorted in by Thomas Whitty. He had picked twenty young women – no doubt the prettiest – who were dressed in white gowns with purple ribbons around their waists with the words ‘Long live the King’ inscribed in gold letters on them. The workers sang ‘God save the King’ before the Royal party walked around the workshop. They were much impressed and, before leaving, Queen Charlotte ordered some carpets and left “… a handsome sum for the workforce”. Three years later, in 1792, Thomas Whitty died. He was buried in the grounds of the church he had devotedly attended all his life. The chapel was pulled down in 1875 but the United Reformed Church now occupies the site, and Thomas’ grave can be seen there. The original gravestone was damaged during the Second World War but was replaced by the present Axminster Carpet Company. The business was then taken over by his son, also called Thomas Whitty Jr, whose main business while his father was alive had been as a banker in Axminster. Unfortunately he too died in 1799 leaving the business in the hands of his 24-year-old son, yet another Thomas Whitty, assisted to some degree by his younger brother Samuel Ramson Whitty (then aged just 15). 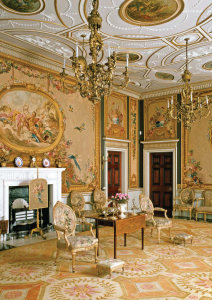 As an illustration of how difficult life could be for businesses at that time, a magnificent carpet which can still be seen in the Music Room at Powderham Castle was made in 1798 by Thomas Whitty Jr, but not paid for until 1803, four years after his death. Although full payment, with interest, was made to his widow Susannah, delays in payment of this nature were not uncommon at that time, and could easily be fatal to a business. As illustrated below, whereas the first Thomas Whitty started the business in his early 40s and lived to be almost 80, his son (Thomas Jr) died before his 60th birthday having held the reins for just under 7 years. Then his son (Thomas Whitty III) died in his mid 30s after a decade in charge, and in 1810 the running of the family business passed to his younger brother Samuel Ramson Whitty who, up to that point, would not have expected to take over, and had been exploring other opportunities away from Axminster. At almost exactly the time that Samuel Ramson Whitty took charge the factory received a highly prestigious order from the Prince Regent (later George IV) for three carpets for The Royal Pavilion at Brighton. Then the year 1826 saw the making of what was probably the most magnificent of all the Axminster carpets, and certainly the largest, measuring 74 feet by 52 feet. 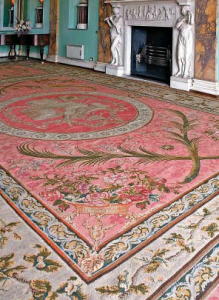 Early in 1827 this carpet was delivered to the Sultan of Turkey, at that time an ally of Great Britain. It cannot have helped Samuel Ramson Whitty’s business when later that year, in a sudden re-shuffling of alliances, the British Navy helped to sink a large part of the Turkish fleet. In January 1828 a fire which started in an adjoining malthouse destroyed or damaged nearly all of the Whitty family’s carpet factory. The factory was quickly rebuilt, on a much grander scale than before and on a slightly different site. Although several more prestigious carpets were made, for Windsor Castle and for the Goldsmiths’ Hall, for example, the business started to struggle. The critical factors were probably a combination of foreign competition, payment delays (notably following the death of King George IV) and significantly higher overhead costs associated with the new building. Samuel Ramson Whitty was declared bankrupt in 1835, and all of his assets including his home and other property, the factory building, the looms, designs and remaining stock were sold at auction the following year. The looms were sold to Wilton Carpets, near Salisbury.